One of the highlights for me of this year’s VNPS Annual Meeting was the opportunity to explore a colony of ginseng (Panax quinquefolius L.). On a walk led by Tom Dierauf, our congenial group explored the plants and geology of the Blue Ridge Mountains and the eastern edge of the Shenandoah Valley. Walking off-trail and up a steady slope, we first encountered the hole. Our leaders had scoped out the site and had seen ginseng around ten days prior. Now it was missing, an empty hole robbed of its contents. We stared at the hole with frustration and disgust. Shortly thereafter to our uniform delight, we finally stumbled on ginseng. While we found a number of plants, we also found a number of holes. We speculated as to whether the thief (or thieves) left the present ginseng intentionally or had never found it. 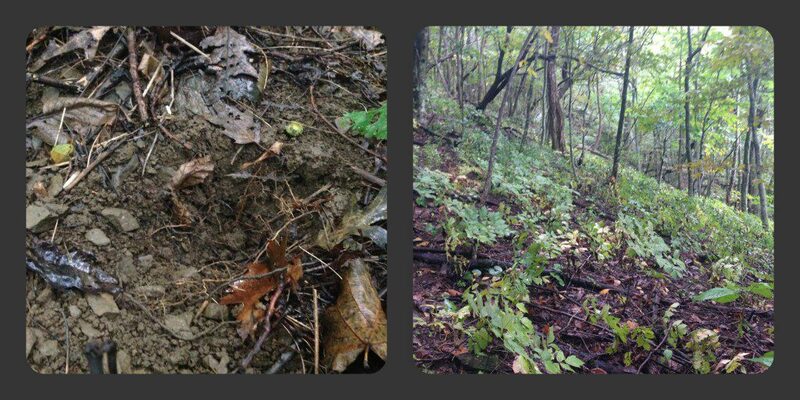 The hole where ginseng was removed versus a healthy colony on a hillside. Ginseng is slow-growing but has a potential life expectancy of about 60 years. It is a member of the Araliaceae family or ivy family. The genus Panax has 14 species, 2 in the Piedmont and mountains and the remainder in Asia (See footnote.) In part due to the high price paid for its dried roots, which are thought to confer therapeutic and aphrodisiac benefits, and other more familiar threats, it is now infrequent in the mountains and Piedmont and rare in the Coastal Plain. Angered by my direct experience with the poaching of ginseng, I poked around the internet to learn what techniques are being employed to discover and thwart such poaching. NPR produced a story last year highlighting the trade. Youtube even has a video highlighting ginseng enforcement in Great Smoky Mountains National Park. Tom later reported the theft to an enforcement officer with the National Forest Service. The officer was very concerned and noted that the Forest Service does get a lot of convictions for ginseng poaching. I was heartened to hear of their interest in the poaching and excited by our exploration of the ginseng colony. For me, the real aphrodisiac was finding ginseng. Thanks to VNPS, Tom Dierauf, and the annual meeting organizers for the opportunity. Spira, Timothy P. Wildflowers & Plant Communities of the Southern Appalachian Mountains & Piedmont. Chapel Hill: University of North Carolina Press, 2011. 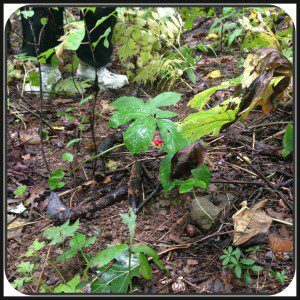 Filed Under: Conservation, Home Page Tagged With: ginseng, illegal harvesting, native plants, Panax quinquefolius L.